Don’t be fooled by Definitive Audio of Seattle’s intentionally understated exterior. 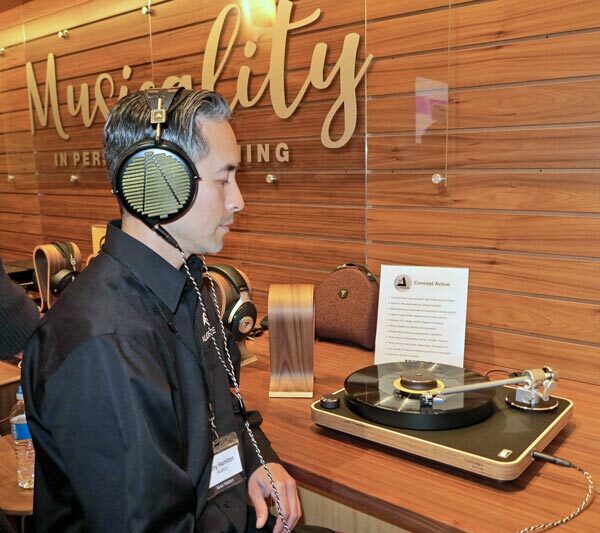 In my five years covering the annual four-hour Music Matters showcases, I have never heard such stellar sound from the store’s six showrooms and head-fi listening area. In fact, four of the exhibits at Music Matters 14, held on Thursday March 7, together offered the finest sound I have ever experienced at any show or store event. And I’ll swear by that statement. 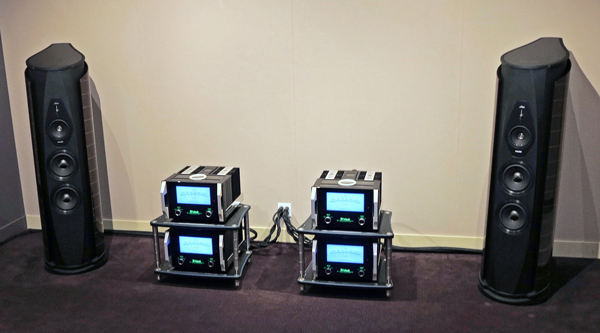 Let’s start with the all-audio system, housed in a 23′ x 18′ x 10′ space, that featured Wilson Audio’s large Alexx speakers ($111,200/pair) driven by D’Agostino Master Audio Systems Relentless monoblocks ($250,000/pair), as well as two Wilson Subsonics ($37,500 each) driven by hidden D’Agostino Momentum M400 monoblocks ($65,000/pair). You might initially think that this system was all about blast-you-out-of-your-seat power (which it certainly had), but its strong suit was the ability to reveal the most minute details and shadings within the context of an extraordinarily large soundstage. Seated in front row center, I witnessed Wilson’s Peter McGrath deliver one of his most perfectly timed and eloquent presentations as he let the music do most of the talking. Sticking to digitalI cannot comment on the room’s Clearaudio Master innovation turntable w/Goldfinger Reference cartridge ($110,000)/D’Agostino Momentum Phono preamp ($28,000) LP playerhe cannily began with Gregory Porter’s “Holdin’ On.” I say “cannily” because he and the folks in the other Wilson/dCS room (see below) conspired to play some of the same tracks so that people could hear the difference that close to an extra million dollars makes. I was in awe of how impactful this simple track was. The top was ideally alive, with the subtlest of brush strokes on drums highlighted as though each slim stick of metal was a magic wand. Every subtle dynamic shift was conveyed with an ease and surety that comes with amps and speakers of this size and refinement. This was my first listen to the Relentless monos, which put out 1500W into 8 ohms and 6000W into 2 ohms, offer pure class-A for their first 100 watts, and weigh 570 lb each. To say I was maximally impressed is an understatement. Although Alexx puts out plenty of hefty bass on its own, McGrath added the two massive Subsonics to show how the addition of carefully adjusted subs can increase the sense of air and space, and make a presentation more three-dimensionally compelling. The Subsconic was phase-coherent with Alexx, extended down to 8Hz, and crossed over at 32Hz, with rapid roll-off above that. When McGrath switched it off and on and off again, its contribution to three-dimensional reproduction was uncanny. Next came soprano Renée Fleming singing “Oh sleep, why dost thou leave me” from Handel’s Semele. I’ve heard this track many timesperhaps one too many timesbut the additional detail and subtlety the system drew from voice and orchestra held me in rapt attention. The system’s ability to equally spotlight the small and the big were the standouts of a track by Malia. Bach’s “Wachet auf” (Sleeper’s awake), played by the trio of Chris Thiele, Edgar Meyer, and Yo-Yo Ma, sounded sensational. I’ve used this identical 24/96 track multiple times in equipment evaluations, and I’ve never heard it sound anywhere near as realistic as in this system and space. Also heard, and of equal importance: dCS Rossini SACD Transport ($23,500), Vivaldi DAC ($35,999), Vivaldi Upsampler ($21,999), and Vivaldi Clock ($14,999); Vortex footers under Vivaldi units) ($1295 set of 4); D’Agostino Momentum Preamp ($35,000), HRS VXR system rack with M3X platforms ($63,025); and Transparent Magnum Opus, Opus, and Reference XL cabling ($lots). 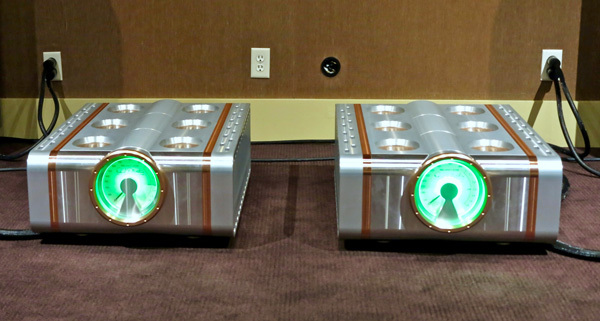 To quote the female half of a male-female couple who learned about the event from the print issue of Stereophile and approached me in the hallway, “That’s the first system I’d pay a million dollars for.” I should have gotten their contact information so I could pay a visit. I’ve attended a number of surround home theater demos, all of which attempted to blow visitors away with a seemingly un-ceasing series of searing explosions, battles-to-the-death, and cosmically-proportioned cataclysms. 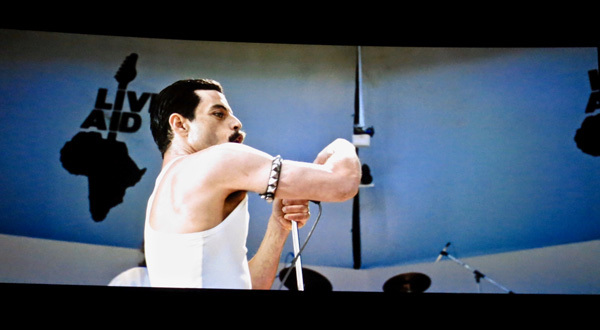 Here, in a 22′ x 16′ x 10′ room (with sloping ceiling) outfitted with oversized leather chairs arranged theater-style, a number of major companies opted instead to showcase clips from three recent music-themed movies. Instead of fire and fury, we got Lady Gaga and Bradley Cooper dueting fabulously, Ramey Malek knocking it out of the park as Freddie Mercury at Live Aid, andI guess you have to have one lemona preposterous Hans Zimmer concert in which countless symphonic musicians and choristers struck vapid poses while expending huge amounts of energy on music that amounted to nothing at all. Two things stood out about this truly fabulous demo: 1) the sound was deeply immersive, yet generated by a mid-price speaker array; 2) the images were so finely detailed and illumined that my experience was light years beyond watching A Star is Born and Bohemian Rhapsody in little old Port Townsend’s sole Dolby Atmos surround Uptown Theater. I sat in total awe. I guess that what can happen when you outfit your den with Bowers and Wilkins 702s2 speakers ($4500/pair), HTM71s2 center channel ($1350), two HTM72s2 as surround speakers ($800 each), four CCM7.4 for Atmos ($750 each), two JL Audio F113v2 subwoofers ($4700 each), a Sony VPL-VW885 projector ($24,999), UBP-X1000ES UHD player ($599.99), Kaleidescape movie player, M500 ($3995), Stratos ($6995), Anthem AVM60 surround preamp ($2999), STR stereo amp (front channels) ($5999), and a pair of MCA525 5 channel amps ($3499 each). “You cannot achieve a good outcome if you do not physically optimize the placement of the main speakers in the room first. We carefully positioned, leveled, and spiked the main, speakers maximizing their performance without a woofer prior to beginning our efforts couple them with our woofers. 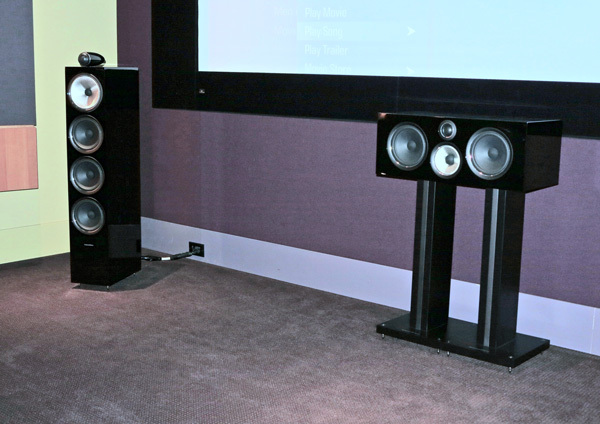 When we initially setup our dual JL Audio F113 woofers, we connected both to the same LFE output on Anthem AVM-60. The woofers were physically separated, one close to the left main speaker, the other close to the right main speaker, hidden behind the screen. 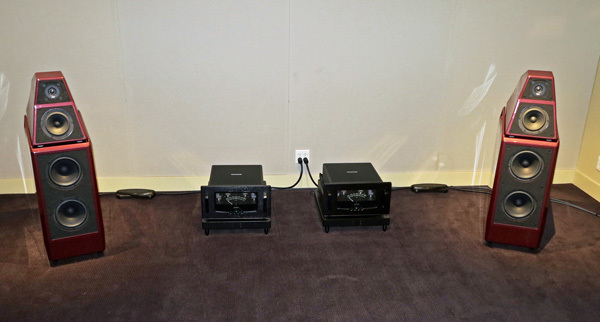 Then, Dan McMillan, our local JL rep, recommended using the 2nd LFE output on the Anthem AVM-60 to run a separate cable to each woofer, pairing one woofer with each main speaker. To get them acoustically time-aligned, we fed an 80Hz test tone into an unused analog input on the Anthem AVM-60. We then inverted absolute phase of the left main speaker (plus becomes minus, minus becomes plus) and adjusted the phase control on the left woofer to the point with the least output. To do this you place your head equal distance between the woofers driver and the main speakers bass drivers. You rotate the phase control back and forth quickly at first to hear the full extent of the difference, and then move slowly to find the center point of the lowest output. When complete, correct the left main speaker’s wiring and repeat the process on the right channel. “Getting the woofers and main left/right channel speakers rhythmically aligned made a big improvement. Then we attacked the high-pass and low-pass crossover points. We listened to all options in 10Hz increments between 40Hz and 100Hz, and landed on 80Hz because it worked best in our installation.” A few words to the wise. 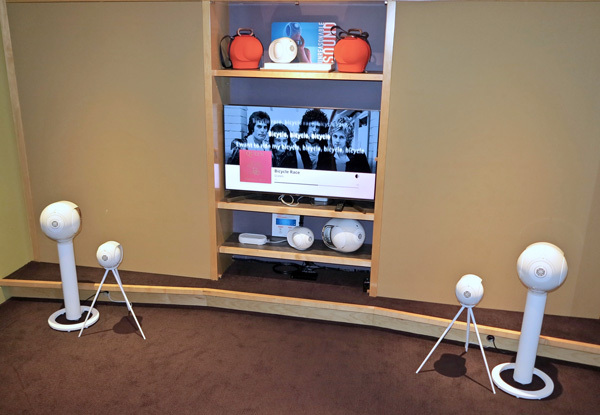 Devialet’s exhibit of the 4500W, 4-way, 3-driver Gold Phantom ($2990/each) and 900W, 3-driver Phantom Reactor ($1299 each), both with analog digital hybrid amplifiers, filled a 16′ x 14′ x 9′ room. While advertising videos cycled continuously, the Devialets sounded mechanically fit while appropriately playing Tidal-sourced industrial music streamed via Airplay using Roon music playback software. (Roon was the playback software of choice in every room at MM14.) Kudos to Roon’s Steve Silberman, who not only managed to deftly handle an unbalanced visitor who continuously interrupted him with questions while sharing information about Roon’s Nucleus ($1400) and Nucleus+ ($2500) hardware, but also played some interesting music. The system did well with spaciousness, but distorted on one track when turned up real loud. Lacking the skill/mindfulness to tune out ambient noise while listening through open-backed headphones, I let Audeze’s Tony Hamilton (above) use Audeze LCD-4z phones ($3995) and premium Audeze cabling to enjoy the sound of the one debut product at MM14, the not-yet-released Clearaudio Concept Active turntable (perhaps $2800$4600) with built-in headphone and phono preamps as well as arm and cartridge. The model in use had a plywood plinth made from stacked Baltic birch. Plinth, tonearm, and cartridge choices will determine the turntable’s exact price, whatever it turns out to be. Hamilton said that the 4z’s 15 ohm driver and 98dB sensitivity enable it work with virtually any amp. Its magnesium housing is also 15% lighter than the LCD-4’s, which is a big plus for someone who, like me, has enough stuff weighing them down as it is. More stellar, transparent, and extremely neutral sound came from the combo of Wilson Sasha DAW loudspeakers ($37,900/pair), named for the late Dave A. Wilson, and the same Stereophile Award-winning Audio Research Ref 160 mono amplifiers ($30,000/pair) and Ref 6 preamplifier that I’ve used and reviewed. 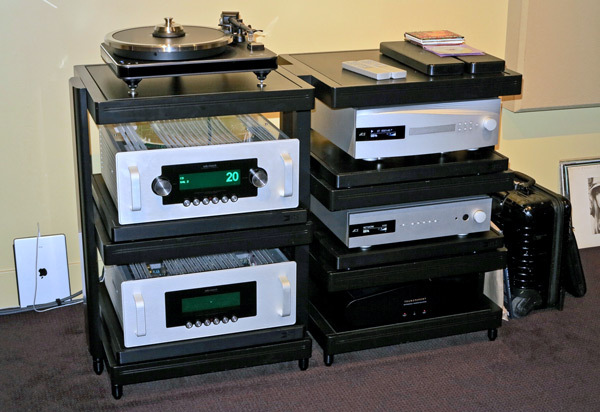 With more than a little help from the dCS Bartok headphone streaming DAC ($15,000), Clearaudio Ovation turntable with Universal tonearm ($10,500) and hardly shabby Goldfinger Statement cartridge ($16,000), HRS RXR frame system with R3X shelves, and Transparent Reference cabling, the system did a better job presenting Edgar Meyer’s bass on the aforementioned 24/96 recording of Bach’s “Sleeper’s Awake” with Yo-Yo Ma and Chris Thiele than in the big Alexx /Relentless room or in my own 16′ x 20′ x 9′ listening room with Alexia 2s, D’Agostino Progression monos, and a dCS Rossini stack. I left deeply impressed and just a little bit jealous of this great sound. 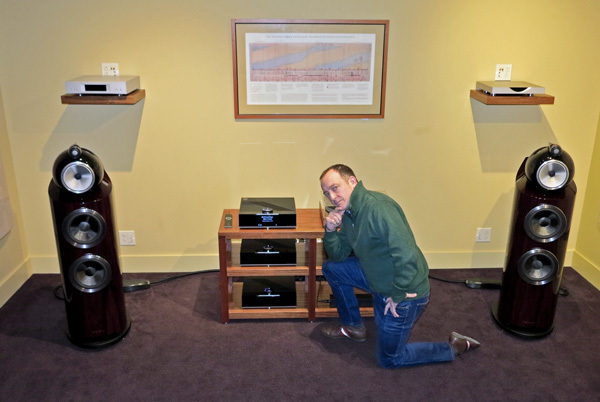 If Linn Audio’s Gilad Tiefenbrun looks a little silly in Rodin-like “Thinker” pose, you should have seen his comedy routine of a demo with Linn’s European brand ambassador, Katie Wilson. Gilad seemed a little surprised that no one present during my time in the 21′ x 14′ x 9′ room owned an upgradeable classic Linn Majik LP12 turntable ($4320) with Lingo 4 power supply ($1890), so he moved on to the Selekt DSM music server with Katalyst ($6999), which is available in four configurations, with or without DAC. Together with some combination of Linn Selekt integrated amp ($6825), Selekt integrated amp w/Katayst DAC ($8775), and Akurate 2200 stereo power amp ($5200)sorry, Gilad went fast, and I was sitting near the back where I couldn’t easily see what components he pointed to Bowers & Wilkins 802D3 Prestige series speakers ($25,000/pair), Box Furniture HD3W system rack ($5040), and Transparent Ultra speaker cables and Super interconnects, the system sounded quite good on a track by Snarky Puppy. The top was clear, and the engagement of Linn’s “Space Optimization” software controlled low-frequency booming and produced a bigger, more spatially-engaging presentation with an even clearer top. It seems that Linn performs its calculations in the cloud and then transmits them from on high to the product. Those spooked by the thought can ask their dealer to do it for them. After mentioning that the huge catered food spread was really excellent this time around, we end on a high note with Sonus Faber’s Stereophile Award-winning Aida loudspeakers ($130,000/pair); four Mcintosh 1.25KW amplifiers ($12,500 each) plus McIntosh C1100T two-box preamp ($14,000), MCD600 CD player/DAC ($7,500), and MT2 turntable ($4500); AudioQuest Niagara 7000 power conditioner ($7999) and Dragon cabling; and Bassocontinuo racks. The midrange was distinctively McIntosh and extremely beautiful, highs smooth as can be, and every track a joy to listen to. Some years back, after hearing Melody Gardot’s “Your Heart is as Black as Night” on big Focals at Nuts About HiFi in Silverdale, I bought the CD and tried to make that track sound as good in my own system (whose speakers do not have powered subwoofers). It may sound much better now, but boy oh boy, were Will Kline and crew doing something very, very right. (I think McIntosh room correction software was one of their secret weapons.) I now have a new goalmake Melody Gardot sound as smooth, detailed, and seductively intimate as in this room. Bravo.